Event Details: An amazing way to express yourself using giant brushes and large pieces of paper in a contemporary Asian brush painting style. 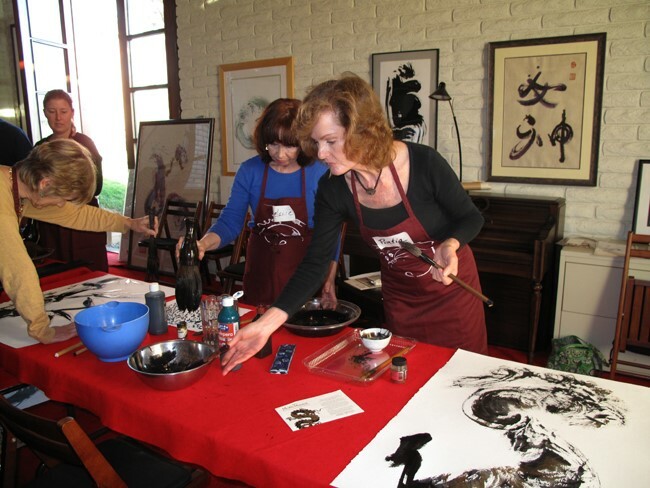 Rosemary KimBal is a Master Teacher of Asian Brush Painting, and her studio is filled with inspiration. Portia La Touche is her assistant teacher. We have lunch together and even energize our bodies with some Tai Chi. No prior painting experience is necessary. All supplies are provided, including brushes, inks, paints, and paper. All you need to bring is your imagination. Portia and Rosemary have been painting and exhibiting together for many years. Here are some photos from prior workshops. Please register at the Dancing Brush Studio website, or contact Portia if you would like more information.